What occasion is “special enough” to warrant opening that really nice bottle of wine? In honor of Open That Bottle Night, some thoughts on why a bottle of fine, aged wine is an excellent addition to any special occasion, and, by the way, what occasion actually is “special enough” to open that bottle, anyhow? There’s a statistic going around that something like 80-90% of wine purchased in America is a current vintage that is consumed within one to two days after purchase. This is astounding, and gets me thinking about how nice it is to have a fine, aged wine at the ready to complement any occasion in life worth celebrating. 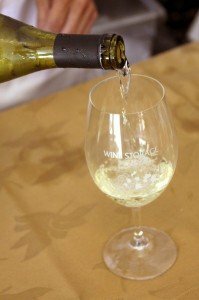 Wine is a truly unique beverage that can improve in quality, flavor and complexity as it ages. Also, by virtue of my earlier-mentioned statistic, time can help create a beverage of greater scarcity and, thereby, greater value. Starting with a fine wine can only improve such an investment. Here’s how to start “saving” wine, if you haven’t already. Here’s how to start: When tasting a wine you enjoy, particularly one that seems like it might benefit from more time in the bottle, don’t just buy one – buy two or three, and set them aside. Remember that not all wines improve with age, and those that do typically have a maximum age limit within which it is best to be enjoyed. Typically, fuller-bodied red wines that are higher in tannins and acidity will age well; white wines that have a high residual sugar are good for aging. Ultimately, let your palette be your guide. Keep these wines in a safe place, preferably dark, at a constant temperature (around 55 degrees), at approximately 65% relative humidity. Most importantly, however, keep them out of sight and away from temptation. Wine Storage Bellevue Now Offers Free Cellar Relocation Service Insurance Coverage for Personal Wine Collections – What Do I Need?